I'm used to Ed Brubaker's Marvel books proving me wrong. Whenever he's taken the reins of a Marvel title I would usually avoid, he's made me a loyal reader. So when I saw the cover of Secret Avengers: Mission to Mars, in spite of my initial reaction that it looked like Brubaker mashed together a bunch of nobodies with no rhyme or reason, I gave him the benefit of the doubt. At first, I thought my trust was well placed. Initially it seemed that the team concept was something like the small squad of Ultimates who worked towards the same goals as the public team in the first Ultimates volume, but in secret. While the Secret Avengers are a team, they don't hang out together. There really there isn't much interaction between the different heroes at all. They work alone or in small groups; usually pairs. The comic opens with Black Widow and Valkyrie posing as high-price hookers to infiltrate a Roxxon facility in Dubai. Later Moon Knight and Ant-Man break into Roxxon HQ while Steve Rogers, Beast, and War Machine coordinate intel from a secret base. While all this is going on, Nova heads to Mars to investigate Roxxon's dig site there. Unfortunately, the idea of an espionage-style superhero comic is jettisoned pretty quickly. Before the first chapter is over Nova disappears and Rogers brings the team together to rescue him and learn what Roxxon is doing on the red planet. What follows is not, by any means, a bad comic. Brubaker's characterization is good and there's plenty of fun superhero action. It just left me wondering why I should bother caring about this superhero team more than any other. 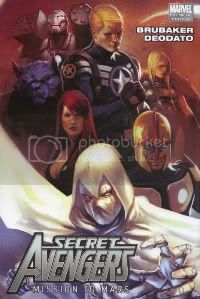 The Secret Avengers don't have any specific team identity. At first, they seem like they do, but as soon as the espionage aspect is pushed aside for the more standard, cosmic-style superhero stuff, they become just another superhero team. My initial fear that they're a bunch of nobodies mashed together without rhyme or reason is proved true. The different heroes hardly even talk to each other. There's no group dynamic to speak of. With the exception of Steve Rogers, pretty much everyone on the team could easily be replaced with another Marvel hero (as evidenced by the strong implication towards the end of Mission to Mars that Rogers will already be replacing one of the team's members). Part of the problem is that Brubaker makes the same mistake I argued he and Matt Fraction made with Immortal Iron Fist. He forgets that most of the character's he's dealing with are not exactly Marvel headliners. With the exception of a couple of flashbacks showing how Rogers recruited Moon Knight and Ant-Man, Brubaker doesn't supply any background on these guys at all. You can get away with that with Grant Morrison's or Mark Waid's JLA line-up. Not so much with the likes of Moon Knight and Valkyrie, especially if they don't speak to each other outside discussing strategy and shouting to each other during fistfights. Like I said, this isn't a bad book at all. It just isn't particularly good. At the very least, if you just can't do without it, I'd advise you be smarter than I was and wait for the paperback.